They are heroes in a half-shell... and all the letters of the alphabet. Available as prints, T-shirts and more at Society6. This is one of the coolest things I've ever seen in my life. Any chance i could have permission to print this for personal use? Are you looking for custom letter designs for a child's birthday or other function? Email me at mikebaboon@gmail.com and I'll see if I can help you out. Click here for some ideas. Thanks for visiting Mike BaBoon Design, the central hub for all of my art, design and other odds and ends. You can reach me at mikebaboon@gmail.com, add me to your DeviantWatch, follow me at Society6 and Redbubble or follow me on Twitter. 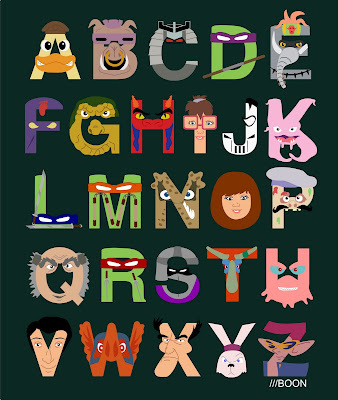 Muppet Alphabet - In T-shirt form!